This is a cute looking unspooky treat for Halloween! Make youself happy with 10 seconds during lunch by adding Rilakkuma fish paste into your everyday meal. Mamegoma bento is so cute and simple to make your day happy. The Chocopa onigiri looks cute and delicious, maybe there is chocolate filling too? Bored at the ideas of making Christmas cookies, cakes and chocolates? Try this cute Hello Kitty snowman bento! 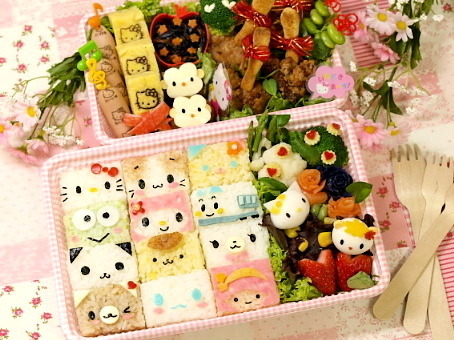 Is there any hidden trick inside this cute Hello Kitty Halloween bento?